School’s back! The hallway has been spontaneously transformed into a dumping ground for schoolbags, and the kitchen bench has disappeared under a load of lunchboxes. There’s no real homework yet, but after only four days of the current academic year I cannot guarantee what my reaction will be if another book to be covered emerges from Marvel Girl’s backpack…the mere thought of contact adhesive fills me with a vague nausea and sense of impending doom. There are always a few wrinkles to be ironed out at the beginning of each school year, but in the scheme of things most of them present only minor challenges. So far Marvel Girl has managed to wear the correct uniform on the right day, Miss Malaprop hasn’t yet lost her (extra carefully labelled) new hat, and I’ve managed to track down one of the last elusive copies of the required Handwriting Textbook at the local mall. (I’m banishing the thought of covering the damn thing yet…I will probably need to perform at least an hour of creative visualisation and yogic breathwork before I even consider retrieving the roll of contact from wherever I threw it in the dark recesses of the cupboard). But, as I said, these are but trivial trials — nothing that can’t be solved by a single application of brain power, elbow grease or a large glass of red wine. No, the big challenge is The Name Game. The Name Game, for those of you who are blessedly unaware of its existence, is that jolly pursuit we parents pursue in playgrounds across the country at the start of every school year. We begin by greeting our close friends, some of whom we haven’t seen all summer, with enthusiasm — we ask after their spouses, natter on about the older and younger siblings of their child who is in your child’s class, perhaps even mention their dear devoted dog — all by name. We feel confident, chatting away. We’re upbeat. This is going to be a great year! I mean, look at me — just look at me — talking away, remembering those monikers, getting it all right! And then, we turn to say hello to some other friends, or maybe — more accurately — they’re acquaintances. Their child was in the different class last year, and while we cheerily say, “Hello Hermione!” to their adorable daughter, we inevitably turn to the parents and acquire a slightly fixed grin before asking, “Hi, how are you? How were the holidays?” (perhaps a little bit too brightly) to distract them from the fact that you can’t quite recall their name. But we excuse ourselves, on this occasion, because let’s face it: the kids are all in identical school uniforms, so you are forced to associate their actual faces with their actual names. But the parents? Well, it’s quite possible that Marty’s mother was wearing a red spotted top when you meet her, but who in God’s green earth knows what she has on today? But then you begin walking toward the school gate, feeling a little less poised but remaining ready for the next drop off (at preschool this time…there can’t be too many faces to contend with there, right?) when you bump into a tearful mother of a new kindergarten pupil who clearly knows you from somewhere, and you offer reassuring platitudes and rummage through your handbag to proffer tissues all while racking your tiny brain for some clue as to where it is that you met them (Was it Playgroup? Music class? No…maybe Swimming? Or Ballet?) in the faint and very distant hope that you might recall something — maybe even just the first letter — of their name. By the end of the week, when you’ve traipsed through school and preschool playgrounds, dropped and picked up kids from a mind-boggling array of extra-curricular activities, and received three invitations for upcoming birthday parties for children you are now unsure whether you actually know, you’ve had it. Your confidence is shot, the week is a blur of a thousand faces, and you can barely remember the names you once bestowed so lovingly on your own children. Your sleep has been troubled, as you’ve been jolted awake in the small hours of the night, finally recalling that it was Marissa who had a kid starting at Marvel Girl’s school this year, Marissa who you met at Playgroup two years ago, and her daughter’s name was…oh dear God…what was her name? Yes, The Name Game gets us every year. It’s akin to being asked to swallow a baby name book and subsequently regurgitate it in certain combinations at very specific times — basically, when Sally waves at you from her car in the Kiss and Drop line, and you need to recall — instantaneously — that her husband is Paul, that William is in Marvel Girl’s class, that their twins are called Mabel and Molly (not at preschool yet, bless them) and they have a cat called Elvis. And when you do actually get it right (don’t forget to buy yourself a lottery ticket afterwards), you feel like you’ve just won the City to Surf in world record time or nailed the Croquembouche Challenge on Masterchef. I haven’t got through the first full week of this year’s Name Game yet. I’ve already had moments when I’ve only managed to smile and nod at a sort-of-familiar face, and one instance when I actually had to ask someone I know well whether I had correctly introduced her to someone who I knew but she didn’t. It’s becoming abundantly clear that I’m no Sherlock Holmes: if I ever had a Mind Palace, it’s now so full of names and random facts about Disney fairies and every last lyric from Frozen that there is room for no more. But that’s the nature of The Name Game. It gets to you like that. At this point, it’s a wonder that recall what my own name is. Thank heavens the kids just call me Mum. That, I think, I can remember. Haha, so true, but you forgot the worst of the lot. That mother that you’ve been introduced to numerous times but whose name you can’t remember, but she manages to greet you by name every single time. Even worse, this woman called me on it!! Now I kiss and drop and avoid the playground like the plague! I don’t know if you remember this, but years ago I was introducing you to someone and I forgot YOUR name. The name I have known for the longest in my life. 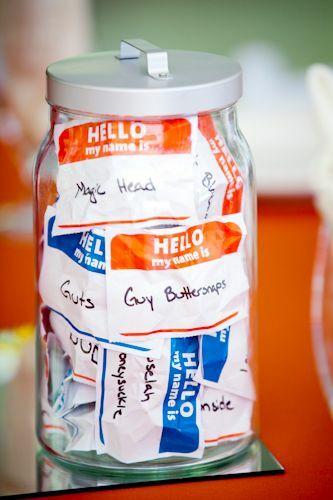 I think we should all just walk around with name tags, would solve many problems! Hey Sim…I’ve had that happen too!!! All last year one mum was happily calling me by name and I couldn’t for the life of me remember hers. This year her son is in Miss Malaprop’s class so I was able to sneak a peak at the teacher’s class list to see what it was! And no…I don’t remember you forgetting my name when you were introducing me to someone…but does that make us even for me forgetting your birthday by one day last year??!! !